Hispanics are already the largest minority group in the United States—accounting for 47.4 million people or 15.8% of the total population—and that percentage is expected to nearly double by the middle of this century. As their population grows, so does the importance of how they are portrayed in the media. From February 9 to August 9, 2009, only a fraction of stories contained substantial references to Hispanics—just 645 out of 34,452 studied. And only a tiny number, 57 stories, focused directly on the lives of Hispanics in the U.S., according to a media content analysis done jointly by the Project for Excellence in Journalism and the Pew Hispanic Center, both of which are projects of the Pew Research Center. During the six months examined, 2.9% of the news content studied contained substantial references to Hispanics. That was more attention than any other group studied except for Muslims. Nearly all of the Muslim coverage involved foreign affairs, while the majority of Hispanic coverage concerned domestic issues and events. 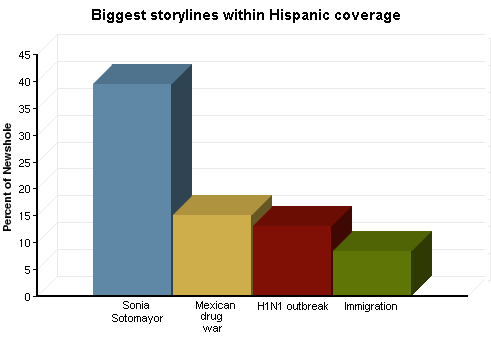 The nomination of Sonia Sotomayor made up the largest share of this Hispanic-related news, 39%, more than twice than of any other storyline. The Mexican drug war came second at 15%; the outbreak of H1NI flu (with its origin in Mexico City) was third, at 13%. Immigration, the number four topic, accounted for just 8.4% of the coverage involving Hispanics during these six months. When immigration was discussed, however, Hispanics were the group mentioned most often. Looking at all of the news about immigration, 34% referenced Hispanics, 10 times that of any other ethnic group. Looking at Hispanic figures mentioned in the news, Justice Sotomayor received far more coverage than anyone else. She was a lead newsmaker in 30% of all stories with a Hispanic element. The only other people to garner even one percent of the total were leaders of Latin American countries: ousted Honduran president Manuel Zelaya (1.7%), Venezuelan president Hugo Chávez (1.4%), and Mexican president Felipe Calderón (1.1%). Since 1990 the U.S. Hispanic population has more than doubled, increasing from 21.9 million to 47.4 million in 2009. And, according to the Pew Hispanic Center, it is projected to nearly triple in size to 129 million by 2050, when nearly one-in-three (29%) Americans are expected to be Hispanic (Passel and Cohn, 2008a). This growth has also broadened across the U.S. According to U.S. Census data, between 2000 and 2007 the Hispanic population grew in 3,000 of the nation’s 3,141 counties. As of 2007, the majority of Hispanics (60.2%) were born in the U.S. (Pew Hispanic Center, 2009a). Nearly two-thirds (64.3%) of all Hispanics identify their ancestor’s country of origin as Mexico. This is followed by 9.1% who say they are of Puerto Rican origin, 3.5% who say they are of Cuban origin, 3.2% who say they are of Salvadoran origin, and 2.6% who say they are of Dominican origin (Pew Hispanic Center, 2009b). 1. U.S. Population Projections, Pew Research Center, February 11, 2008. 4. Percentages in this report are based on newshole, measured as time on TV and radio and space online or in print. For this analysis we studied a total of 815.62 broadcast hours and 6.9 million words across 34,452 stories. 5. In our coding, “lead newsmaker” refers to a person mentioned in over half of a given news story or segment.